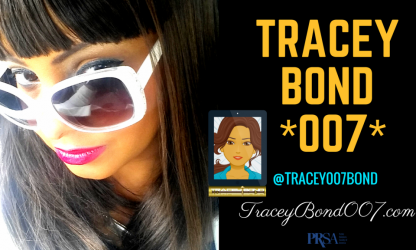 Meeting planners and prospective clients love going, growing…glowing with Tracey Bond *007*. Know Why? Tracey’s presentations are influential, impactful thought leading, and engaging vivid high-definition visuals! Tracey’s Speaker Bio: Her name is Bond,Tracey Bond…Tracey is an emergent social business celebrity & double Press agent/PR solopreneur, who serves extraordinary clientele with award-winning talents & multi-industry skills at her Beverly Hills launched Beneficience.com Prolific Personage PR operative and mediaphilic ™ prodcast ™ show “SPEAK! @intothePODlight” on BlogTalkRadio. Bond entertains her fond description as an online media industry’s ‘Olivia (PR)ope of PR hope…and scope!’Daily Tracey can be found sweet-spotting the spotlight online to offline for her clients by introducing, sourcing, sporting and courting their personage & perceptions with her niche for digital brand journalistic selections.As a VIP journalist, Bond’s Top 10 U.S. Press Agency’s VIP news & social intelligence news beat is globally distributed to thousands of intentional readers and trends-to-spotlight the sensible events and interests of: VIP, Celebrities, Lifestyle & Society, Social Business Event News, Celebrities, Entertainment and Online Media centric to social good. Moving forward via this double press agency/pr platform, Bond continues to build an elite clientele base upon her personable media brand showcase of high-profile digital brand journalism, speaking and publicity all which carry an authentic & distinctive trifecta of marketable excellence. TRACEY’s SOCIAL BUSINESS EXPERTISE TESTIMONIALS !! !